AS MEMBERS OF THE SAME SPIRITUAL FAMILY, WE SEEK TO EQUIP ONE ANOTHER FOR SERVICE. THROUGH A STEADY DIET OF EXPOSITORY, PRECEPT UPON PRECEPT, LINE UPON LINE TEACHING OF THE WORD OF GOD, WE PURSUE SPIRITUAL MATURITY. Regeneration: the act, or process of regenerating, new birth, renewal, and recreation, changing radically and for the better. Calvary Chapel Montreal Regeneration is a Evangelical Christian fellowship that seeks to know and glorify Jesus Christ. We desire to challenge all people to seek after God with all of their heart and mind, ultimately repent from their sins and put their faith in Jesus Christ. Implanted in a secular urban milieu, Calvary Chapel Montreal Regeneration reaches out to the Montreal community by a bold verse by verse teaching of the inerrant Word of God (the Bible), in a culturally sensitive, intellectually challenging and pertinent way. The message of a significant and abundant life found only in Jesus Christ is presented regularly. Just over a decade ago, a small group of people from disparate cultural and spiritual backgrounds met and began to worship together within a small inner-city theatre/dance rehearsal space; and it was there that Calvary Chapel Montreal Regeneration was born. Ten years later, this thriving English and French church community continues to meet weekly, bringing joy and hope to an otherwise desolate secular landscape. Calvary Chapel Montreal Regeneration's primary teaching pastor, Pastor Sebastien, follows in the footsteps of men like Greg Laurie, Skip Heitzig, Mike MacIntosh, and Raul Ries as well as hundreds of others associated with a Calvary Chapel church revival known as the Jesus Movement. This particular church revival rapidly spread from coast to coast in North America, bringing thousands of young people to Jesus Christ starting in the late 1960's. Today, the revival continues to thrive, as currently there are more than 1700 active Calvary Chapels the world over, with others of the same origin taking root each year. The original Calvary Chapel is in Costa Mesa, California, and was founded by Pastor Chuck Smith in 1965. With a sincere concern for the lost, Pastor Chuck sought to reach out to a younger generation of hippies and surfers that evidently struggled to find their place within contemporary church gatherings. He welcomed all, without judgment, boldly emphasizing the teaching of the Word of God verse by verse. In September 2013, Pastor Chuck went home to His Lord, yet his successors continue to preach the Gospel according to Pastor Chuck's methodology. As a result, Calvary Chapel Costa Mesa is among the world's largest churches. Over 25,000 local people attend weekly Sunday services, touched by the simple, yet sound approach of this particular style of expository preaching. Born in Montreal, Sébastien Frappier became a professional actor at the age of thirteen. Despite regular appearances within Quebecois television, film and stage productions for more than ten years, Sébastien found himself increasingly disillusioned by the local industry, and left for California to pursue secular fame. As it happened, Hollywood would never know Sébastien Frappier. Within the hot desert of New Mexico, the gift of new life through Jesus Christ became real to Sébastien. Personal ambitions to rise to fame melted away as a new greater purpose for living slowly impressed itself upon his heart. After attending Calvary of Albuquerque's School of Ministry in the early 90's, Sébastien became a pastoral intern to a 15,000 member congregation under the leadership of Pastor Skip Heitzig. Sébastien then worked as a full time ordained pastor at Calvary of Albuquerque as a Bible teacher, a Church History teacher, a Biblical counsellor, and an overseer of several ministries, including 35 home fellowships. 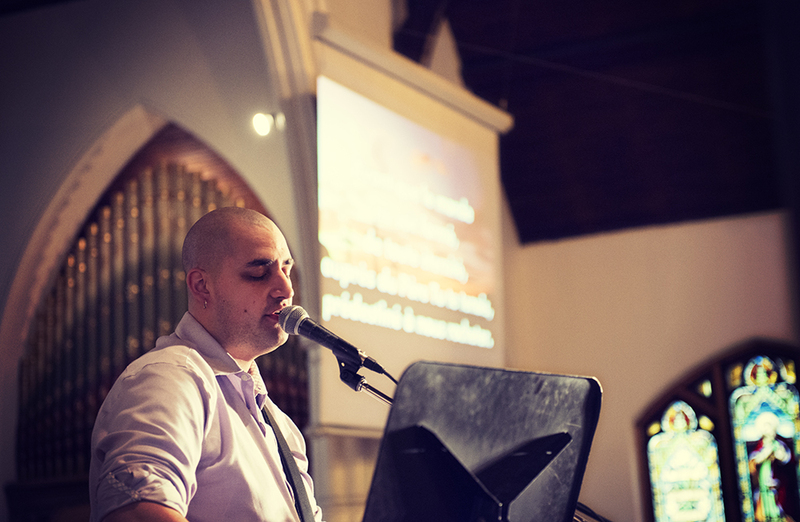 Sébastien then returned to Montreal in 2004 and founded Calvary Chapel Montreal Regeneration that same year. Sébastien is married to Andréia and has two sons, Jude and Luke.